Tiny Toes in SoCal Sand: Busy B's and Bees! What a busy month May is! I've just ordered all of the teachers/therapists/aides end of the year gifts for these amazing women who work with and love my children. There are about 14 of them! I'm busily putting that together as well as organizing Tiny B's Tube Free Celebration for this coming Saturday. These things along with a bunch of other out of ordinary happenings have kept us busy as bees! Last night I couldn't sleep because my mind wouldn't stop racing with all of the things that I need to get done. I'm looking forward to next year where a few things that will really make a difference will be different and hopefully make for a calmer me. Strong B will be home with me so this means that I won't be dropping him off and picking him up 4-6 times a week, and I'm really praying that Tiny B can get her occupational therapy during her writing lessons in school. The extra therapies are what really exhaust me. I already know that I'll need to take her to additional speech, but I'm just praying that we can stop the constant in and out of the car, which will make for a much better homeschool teacher in me. But until mid-June, we'll continue to go one-hundred miles an hour. A homeschool mama told me last summer that I would have so many social activities for the kids that it would be hard to fit school in. Boy, was she right! 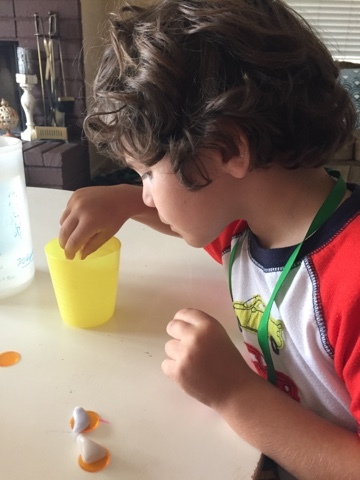 I spent time planning out the beautiful Boats and Floats theme for Mother Goose Time (MGT) this month, and the kids are chomping at the bit to do all of the watery fun things. I decided to do one last day to finish up a few lessons that we didn't get to this month. 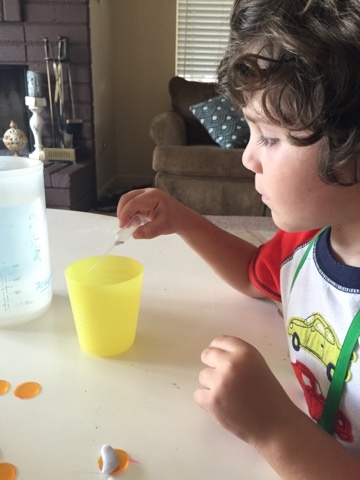 This lesson goes all of the way back to Day 2 of bees and their food. (I started the month with the end of the month's lessons on butterflies because we were raising our own beauties). I'm attending a homeschool conference next month and one of the classes is on grandparents and homeschooling. 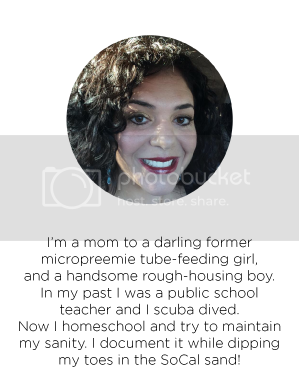 At last year's conference one beautiful speaker described how she homeschooled her children throughout their childhood and her husband's mother or grandmother (or maybe her elderly grandmother?) lived with them and contributed a great deal to their upbringing. That really resonated with me. 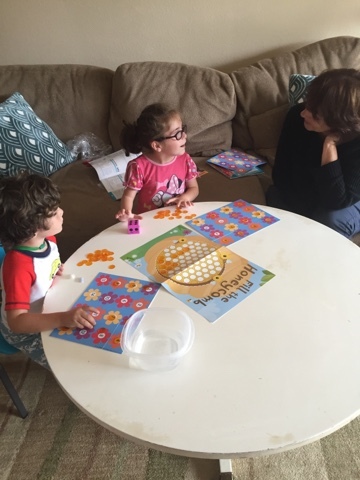 My mom and stepdad live very close and I love when she comes over and teaches them. She took a Waldorf art class about are and children last week and learned so many things. Today she did Mother Goose Time with the kids. What fun she is having! The first activity involved the kids being busy bees and transporting their pollen to their hive in their second stomach, which is for storage. I did want to use ice cube trays as their hive, as the teacher guide recommended, but I couldn't find any. That would have been fun. They still managed to squeeze their droppers and transport their pollen (water) for a surprisingly long time! I could probably have kicked back and read a magazine if I would have known how long they would want to explore with the droppers! Strong B was really engaged with this activity. Tiny B got excellent fine motor practice as she squeezed the dropper over and over again. 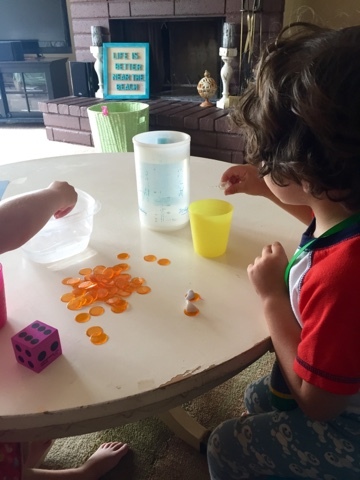 She kept looking at her brother's cup to see if he was filling it faster than her. She was not having that! I'm discovering just how competitive she is. I'm thinking God blessed her with this characteristic and she has used it for strength ever since she was born in her tiny one pound and eleven ounce body. 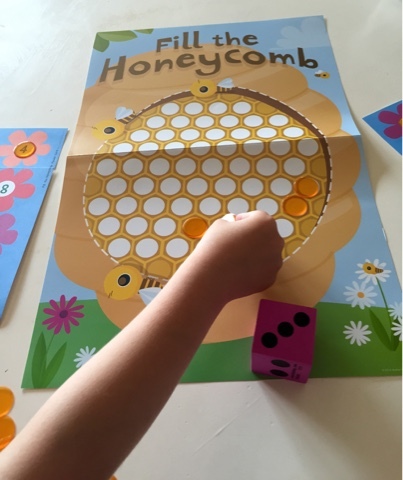 After about 10-15 minutes of squeezing the droppers, we watched a few YouTube films on bees, and then we moved on to the "Fill the Honeycomb" game. First we counted the numbers out loud to sixteen (I want Tiny B to have mastery over this over the next month or so and definitely before kindergarten). 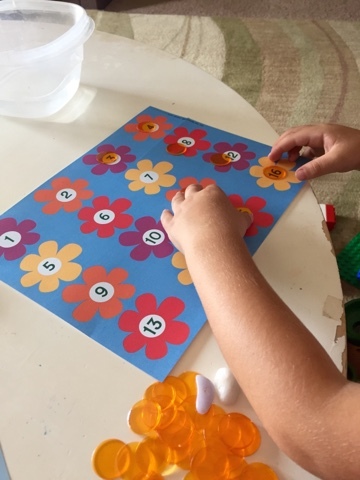 Then we took the "pollen" (the see-through circle counters) and made a "window" over each number to set up the game. 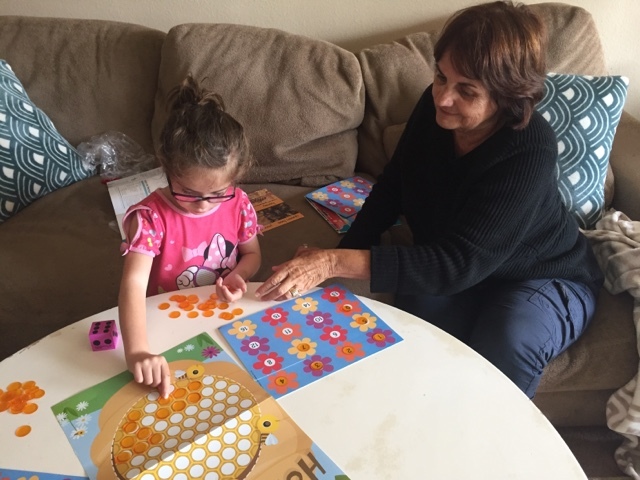 Again, perfect fine mother skill practice using the pincer grasp to place those counters. Here you can see grandma reading the MGT Teacher Guide. They took turns rolling a dice and then taking that number of pollen and placing it in the hive. We worked together like worker bees to fill our hive. April's curriculum gave us six beautiful weeks of lessons and now we are ready to move onto Boats and Floats. I've already chosen the lessons that I want to do and I'm hoping that we can somehow be done by the beginning of June in order to start A to Zoo Animals. We are ready and have our zoo passes and plans in place! 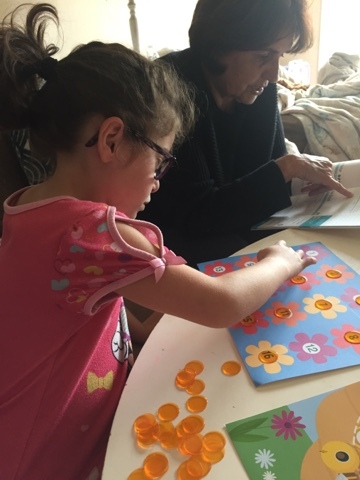 *I receive Mother Goose Time curriculum in exchange for my honest sharing of experiences, resulting from our personal use. All opinions/thoughts are my own and are in no way influenced by others. Dixie Belle Homeschool Room Makeover! 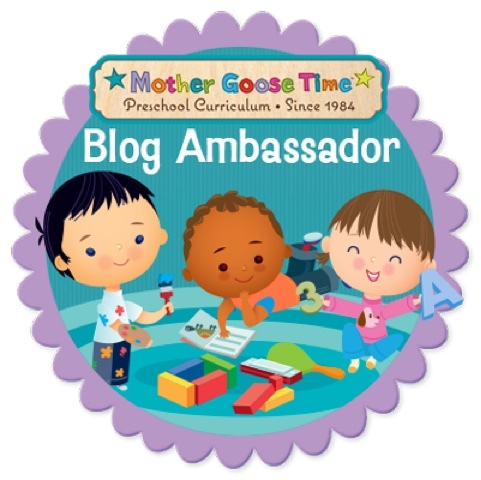 Mother Goose Time Manipulatives Giveaway!